In today’s Notes on Adelaide column, we ask what happened to one of Jay Weatherill’s big Paris pronouncements; Mayo candidates send very different signals in their attempts to raise campaign funds; and the State Government hides the rock-throwing report it accused Labor of ignoring. Jay Weatherill on the streets of Paris in 2015. Labor Premier Jay Weatherill had a special connection with Paris – so special he famously took his own film crew along to document one of his visits. His last visit, in September 2017, was to officially open South Australia’s Paris office. One of his set-piece pronouncements during the trip was news that French company Navya – which makes autonomous shuttles – had agreed to set up its Asia-Pacific manufacturing base in Adelaide. InDaily reported the announcement and then waited for the action… tumbleweeds. When nothing happened we asked what was going on – again, and again, and again – until the election washed away Labor’s responsibility for it. The original announcement wasn’t particularly ambiguous: “Establishing a driverless car vehicle operation here in South Australia is the perfect bridge connecting our past in traditional vehicle manufacturing and our future in advanced manufacturing in a clean, carbon neutral environment,” Weatherill said at the time. However, the new Liberal Government has revealed that the agreement between Navya and the Weatherill administration was rather thin. Wafer thin, in fact. “I am advised that no formal offer or commitment from the South Australian Government to Navya was made, either financial or in the form of an MOU,” Industry and Skills Minister David Pisoni told InDaily. “Renewal SA was prepared to offer land at Tonsley at commercial rates and there was discussion around the potential to purchase autonomous shuttles along with Flinders University also purchasing shuttles. InDaily has asked Navya and the Government what those USA events might be. We haven’t received a response. The Labor Opposition has attempted, somewhat unconvincingly, to deflect blame to the new Government. “Under Labor, discussions with Navya were being led by the Investment Attraction Agency and were well advanced,” said Shadow Minister for Trade, Tourism and Investment Zoe Bettison. That prediction didn’t prove to be accurate. The plan may yet go ahead, but the lack of straight answers indicates there’s a problem. The long Mayo by-election campaign is almost done before it’s barely begun, with Centre Alliance candidate Rebekha Sharkie opening up a huge lead in the polls over Liberal rival Georgina Downer. Sharkie’s messaging is targeting Downer’s weakest point: the fact that the daughter of previous Mayo MP Alexander Downer has returned to SA from Victoria to contest the seat. 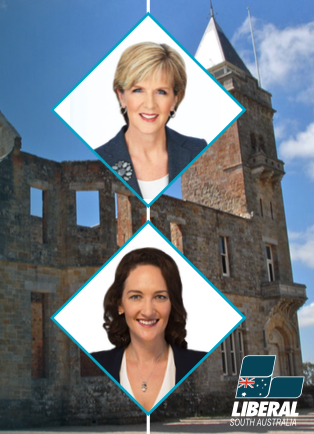 Sharkie is pitching herself as “your local candidate for Mayo”, while Georgina Downer is a “strong voice for Mayo” who is “passionate about representing the community where she grew up”. The battling local versus the privileged blow-in narrative is proving poisonous for Downer – and the respective candidates’ fundraisers this weekend seem unlikely to help. On Saturday, Sharkie is holding a “Rockwiz Music Trivia Fundraiser” at the Echunga Memorial Institute, featuring musician John Schumann, who gave Alexander Downer a mighty scare in 1998 as an Australian Democrats candidate. The following day, Downer will hold her own fundraiser. It will take the form of a “luncheon” with Foreign Affairs Minister Julie Bishop at Marble Hill – the gracious residence built in 1878-79 in the style of a Scottish baronial castle to serve as the Vice-Regal summer residence. The State Government and the Opposition have been engaged in unseemly political battle over an appalling spate of rock throwing on the Southern Expressway – a phenomenon which is difficult to grasp given the potentially fatal consequences. Yesterday, The Advertiser “obtained” a report it says was produced under the Labor Government which shows that overpasses on the expressway were identified last year as being “high risk” rock-throwing sites. You don’t have to be Hercule Poirot to work out how that report slipped from a filing cabinet into the hands of a reporter. The relevant minister, Stephan Knoll, was very happy to reflect on the report’s contents yesterday, saying it showed Labor’s “rank hypocrisy”. “It is absolutely unacceptable that the then Labor Government knew these bridges were high risk and failed to act and install throw screens,” he said. Being curious journalists, we asked Knoll’s office for the report, which the Minister insists is such a damning indictment of Labor. Knoll won’t play ball. His office has indicated that they believe the relevant information from the report is already in the public domain. We all have a right to be suspicious. The Advertiser today gave front-page treatment to the news that Prime Minister Malcolm Turnbull was set to announce that Cabinet had signed off on the purchase of an Australian drone fleet to be based at Adelaide’s Edinburgh RAAF base. It was a good example of the political axiom that the media opportunities from big-spending projects should be squeezed dry. For those following along, the ABC first reported in 2012 that Australia’s defence force would purchase drones. As far as I know, InDaily young gun reporter Liam Mannix broke the story in 2013 that the drones would be based at Edinburgh. In 2014, then Prime Minister Tony Abbott came to Adelaide in the dying days of the election campaign to announce the Government would base the drones at – you guessed it – Edinburgh. The story has been reported every year since.